Yep, you guessed it... Monday means time for my weekly "Not Mes!".... Luckily, I don't think I have too much to report this week. 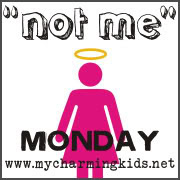 Go check out MckMama's blog for other Not Me! Monday confessions. I have definitely NOT become hooked on The Sing Off. It's fantastic! So, I was NOT the one who voted *ahem* 10 times for Nota to win the competition! Nope, not me! Yesterday I did NOT fall flat on my face while playing with my dogs outside. I did NOT get a huge rash on my chest and face from the grass as I face planted into the ground... and I do NOT have a scratch on my neck today as a reminder of the incident! (Don't worry, I did not land on my belly, just my knees and face! No harm done to LBN!) And today I am NOT extremely sore from my clumsy tumble. I guess that's all for me this week! I saw your blog on Not Me Monday and noticed you were from Texas... I was curious what part of Texas? I just recently moved to Houston from Colorado, so I'm adjusting to a whole new world :) Nice to meet you - enjoyed your blog! Yay, NOTA won! :) They were, by far, the best group on there and will sound fantastic in a recording studio.